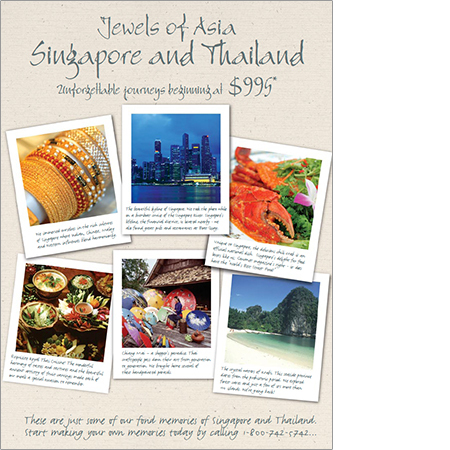 This ad for Singapore and Thailand, produced by Retta Jitner of Media Matters, is written as a series of postcards home, in the voice of a typical traveler. The beautiful skyline of Singapore. We took the photo while on a bumboat cruise of the Singapore River. Singapore’s lifeline, the financial district, is located nearby - we also found great pubs and restaurants at Boat Quay. The crystal waters of Krabi. This seaside province dates from the prehistoric period. We explored forest caves and just a few of its more than 100 islands. We’re going back!